CookingRef contains a list of all known Cooking recipes, ingredients and related cooking items. It can be used to find the ingredients to make any cooked item and what cooking recipes an item can be used in. You can also search for recipes matching a partial name. 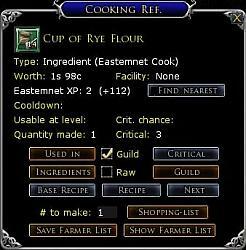 The source for ingredients and recipes is shown, such as Expert Farmer or Loot. There are commands to find the best tools and cooking scrolls for your level to maximize your critical success chance. You can check your known cooking recipes on one or more characters and then use CR on alts to see if a new recipe is needed by your cook(s) or if a given cooked item can be crafted by you. If a recipe requires a facility, you can use the "Find nearest" button to locate the closest one. There is also a window to search through all the cooking recipe scrolls to find ones that haven't been learned yet. 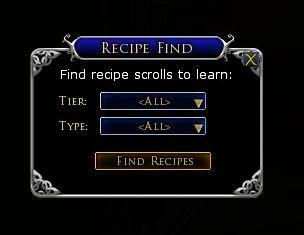 The selections can be filtered by cooking tier and the source of the recipe scroll. There is another window to find the best food for the selected stat buf for your level. Finally, it can build a shopping list of ingredients that you will need to produce a given number of an item, taking into consideration ingredients that you already have in your inventory and optionally, ingredients in your vault. 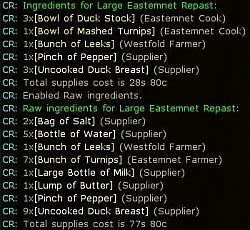 08/18/17 1.11	Added tier 11 recipes (Lotro Update 21). 05/01/16 1.10.2 Fixed Anórien spelling. 02/10/16 1.10.1 Added Greater Essence recipes. 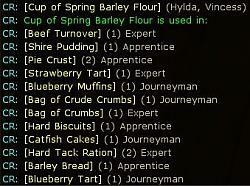 10/30/15 1.10	Added tier 10 recipes (Lotro Update 17). 02/07/15 1.9.2	Fixed several recipes using Partridge. 02/06/15 1.9.1	Updated the cooking tools to the current versions. 11/09/14 1.9	Updated for Lotro Update 15. 08/20/14 1.8.1 Updated Ilex Campfire Kit ingredients. 04/15/14 1.8	Updated for Lotro Update 13. 11/11/13 1.7	Updated for Helm's Deep expansion. 07/17/13 1.6	Added Food Stats Window for finding the best food. 06/18/13 1.5	Added /crc command to check crafting xp costs. 01/18/12 1.4	Added buttons to save and show a farming list. 12/15/12 1.3	Added a find nearest Facility feature and button. 12/10/12 1.2	Added a Shopping-list feature and button. 12/07/12 1.1	Added a window for finding recipes not yet learned. 12/05/12 1.0	Initial public release. There is a new crafting tier, but my cook hasn't advanced enough to access it yet, so it could be a while before I can add the new items. Last edited by Vinny : 10-09-2018 at 05:27 PM. I haven't seen any new cooking recipes with this update. Let me know if you notice any changes. "Cooks have a few new Doomfold recipes automatically granted to them." However, in a quick review of what my main Cook knows, the only change that I noticed is that some of the dishes now have a higher vendor value. If anyone finds some new recipes, let me know and I'll add them. 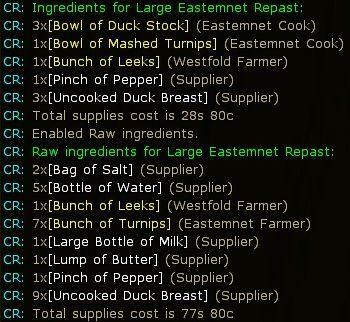 This version adds the tier 11 recipes and materials that are a part of Lotro update 21. While I still have some work left to do, I've fixed all the runtime errors that I found after adding the new items, so this should be a stable release. If you encounter any problems with it, please let me know so that I can fix them in the next minor version. No ETA on when I'll be finished tweaking. Note: Some of the existing food items have had their effects reduced. I'm working on the tier 11 update but have run into some issues with having more than one recipe produce the same product. Getting an error when using Find Food. Works ok for lvl 69 (my cook) but not for lvl 91 (my LM) "Error: Invalid level." Thanks for the report. Fixed in the next update. Does it max out at the lvl of the toon you are using it on? PS Mate you ROCK this is the best thing since sliced bread!! Last edited by justabloke : 11-12-2016 at 07:40 PM. I just updated the CR plugin, and for Farming Ingredients it list Bunch of Pears and Bunch of Rye Berries for everything. That was the last list that you saved. It only changes when you save a new list... Did you read the ReadMe file? This is a minor update that fixes the spelling of "Anórien" in several recipes. 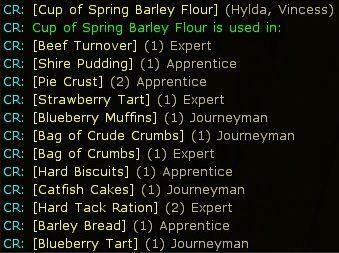 I've been looking for new recipes in Lotro update 18, but haven't seen any. This is a minor update that adds the two Greater Essence recipes from the Old Anorien Quartermaster. Last edited by Vinny : 02-10-2016 at 05:06 PM. This is a significant update that adds tier 10 recipes that are only consumable by level 100s. I didn't find and new guild recipes or rep based recipes and the AH doesn't even let you select for tier 10, but there may not be any loot tier 10 recipes either. I'll probably add a minor update with stat details as I skipped that part to get this released sooner. Update 17 adds tier 10 cooking with several new recipes. It will take me a while to get all the new items added to the database. Probably next week, depending on how my other addon updates go.